The 2018 Volkswagen Atlas represents a new chapter in Volkswagen’s U.S. story. The seven-passenger Atlas offers competitive levels of technology and spaciousness combined with hallmark Volkswagen driving dynamics and attention to detail. 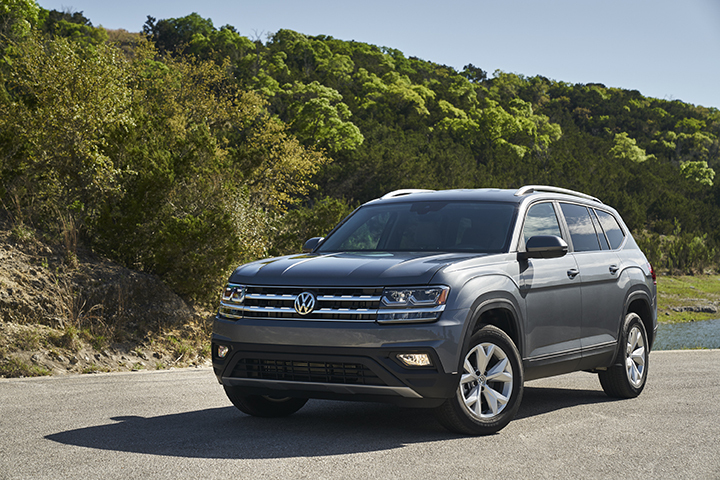 As the newest and biggest member of the Volkswagen lineup, the full-size Atlas SUV offers family-ready passenger and cargo volume, as well as everyday usability and utility. As an evolution of the Cross Blue concept vehicle first seen in 2013, Atlas builds on the latest Volkswagen design DNA to create a bold new look in the SUV segment. Its modern and muscular design retains classic proportions and clean lines. 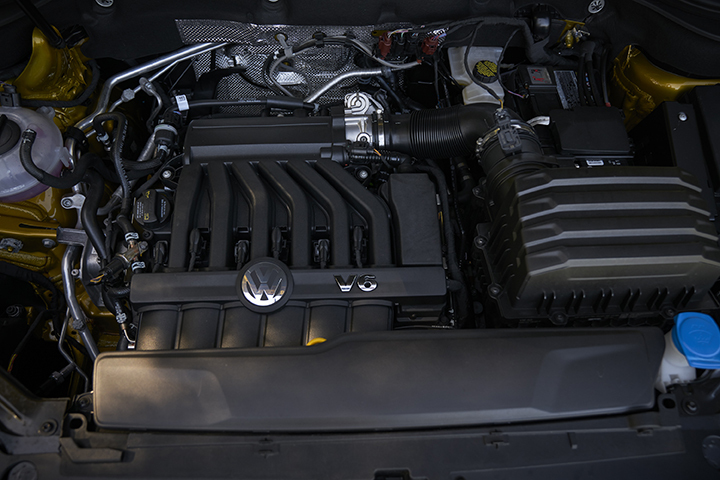 Engineered from Volkswagen’s Modular Transverse Matrix architecture, Atlas sits 198.3 inches long, 78.3 inches wide and 69.6 inches high, larger than any other Volkswagen model on sale in the U.S.
SEL and SEL Premium models also feature a power tailgate with Easy Open, while the SE with the Technology grade offers a Power Tailgate. Easy Open works in conjunction with KESSY keyless access to enable opening of the tailgate with just a kick of the foot below the rear bumper, providing the key is in range. Eighteen-inch aluminum-alloy wheels wrapped in 245/60 all-season tires come standard on all models except the SEL Premium, which boasts 20-inch aluminum-alloy wheels and 255/50 all-season tires. SEL and SEL Premium models can also be outfitted with available 20-inch black aluminum-alloy wheels. All Atlas models feature 8.0 inches of ground clearance and departure angles of 20.4 and 22.2 degrees. The Atlas’ interior design is classic Volkswagen, clean and functional, with a premium feel. Driver controls are positioned for optimal ergonomics and usability, and simple, driver-centric displays enhance involvement behind the wheel rather than distracting from it. The seat position, shifter height and the spacing between the pedals are fine-tuned for driver comfort. Advanced ambient lighting, offered on Atlas SEL Premium, further highlights this upscale character, as does the use of premium materials throughout. Inside, Atlas makes maximum use of its three-row seating layout to offer space for up to seven adults, boasting a cavernous 153.7 cubic feet of total passenger volume. Headroom is 41.3/40.4/38.3 inches, while legroom is 41.5/37.6/33.7 inches, respectively. Standard second-row bench seating offers a 60/40 split, a 14-degree backrest recline function and a 7.7-inch sliding range. An innovative folding mechanism for the second row offers improved entry and exit room by enabling the second-row bench to tilt and slide forward, even with child seats in place. Across all three rows, an array of available inputs 12V and USB auxiliary, in addition cup holders, bottle holders, storage nets and cargo containers provide convenience for all passengers. Atlas has a maximum cargo volume of 96.8 cubic feet behind the front-row seats. 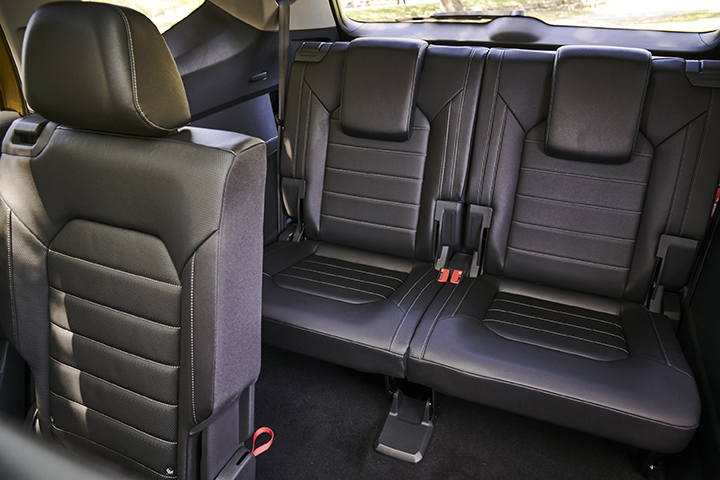 With just the third-row folded, cargo capacity is 55.5 cubic feet, and with all seats up, cargo capacity is 20.6 cubic feet. 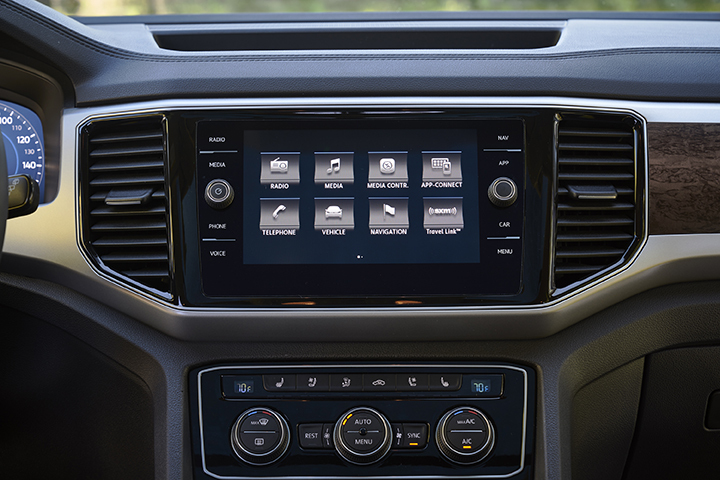 The infotainment system also offers AUX-in, SD card and USB multimedia interfaces, as well as a rearview camera, JPEG viewer, SiriusXM Satellite Radio, HD Radio and support for lossless audio file format. Standard Bluetooth technology can send and receive SMS text messages via voice command with compatible phones and pair two phones simultaneously. There are three speaker configurations for Atlas, dependent on trim level the S model includes six speakers, mid-level trims offer eight speakers and the SEL Premium model features the all-new Fender Premium Audio System with 12 speakers. There is no shortage of entertainment system options with the 2018 Atlas, but the SEL Premium trim offers the most advanced Fender Premium Audio System to date. It was meticulously engineered, specifically for Atlas, to recreate the emotion of a live performance for all three rows of passengers. The system was developed through collaboration between Fender and Panasonic. A powerful, 480-watt, 12-channel amp delivers arena-sized sound to the spacious Atlas cabin. There are 12 speakers in total, including an innovative center channel speaker, woofer speakers in each door, first- and second-row tweeters, and two wide-frequency speakers and a subwoofer in the third row. Powertrains Atlas is offered with a choice of two powerful and efficient engines, a 2.0-liter turbocharged four-cylinder or an available 3.6-liter VR6 engine. Both units feature Start-Stop technology and Remote Start is standard on SE with the Technology trims and above. The 2.0-liter four-cylinder gasoline unit is a member of the latest EA888 engine, utilizing turbocharged induction and direct fuel injection to achieve excellent efficiency while still delivering impressive power. Output is rated at 235 horsepower at 4,500 rpm and 258 lb-ft of torque from 1,600 rpm. With either engine, power is sent through an eight-speed automatic transmission to help maximize efficiency. This transmission then sends the power to either the front wheels, or if equipped with 4Motion all-wheel drive, all four wheels as needed. All Atlas trims can be equipped with either engine and drivetrain option, except Atlas SEL Premium, which is only offered with the VR6 engine and 4Motion all-wheel drive. The Driving Mode Selection feature, equipped on all Atlas models with 4Motion all-wheel drive, allows the driver to select specific vehicle profiles based on driving conditions. It has four settings: On-road, Snow, Off-road, and Custom Off-road. Within the On-road setting, additional options are offered: Normal, Sport, Comfort and Individual. These alter operating parameters for drive systems like the engine, transmission, steering and Adaptive Cruise Control, as well as traction-assistance systems like Hill Descent Assist and Hill Start Assist. The singular user interface is highly intuitive, comprising both a rotary knob and a push-button. 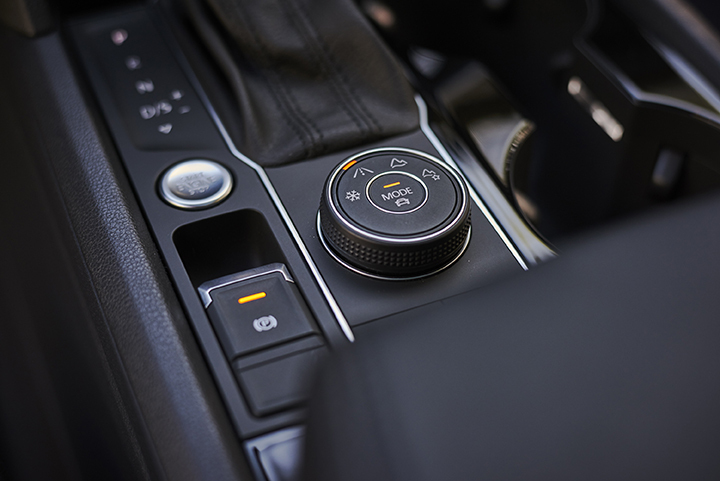 Turning the knob engages the various drive modes, while pushing the button triggers a pop-up menu on the screen of the infotainment system, allowing the driver to fine tune the On-road mode. 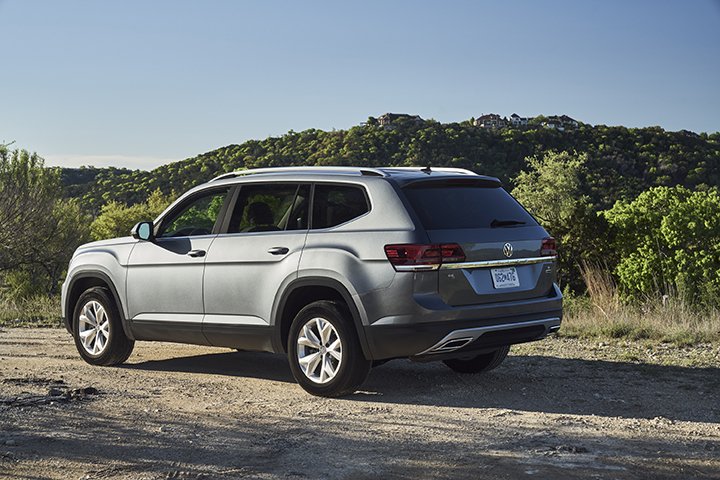 The new 2018 Volkswagen Atlas is designed for the American lifestyle, the Atlas combines striking new interior and exterior design elements, the one I drove the Atlas SEL Premium starts at $48,490. This top-of-the-line model increases the luxury quotient with, the sophisticated 12.3-inch Volkswagen Digital Cockpit, allowing drivers to reconfigure how they view vehicle information; 20-inch aluminum-alloy wheels; navigation; LED taillights; power-folding door mirrors; door mirrors with puddle lights; leather seating surfaces; ventilated front seats; heated rear seats; heated steering wheel; automatic High Beam Control; and ambient lighting. The Atlas SEL Premium also adds the following driver assistance and infotainment features: Parking Steering Assistant; Area View camera; and the Fender Premium Audio System, with a 12-channel, 480-watt amplifier and 12 speakers. Destination for all Atlas trims is $925. Posted in CAR REVIEWS, VW.